Quoderat | Open information and technology. Assign my laptop a static IP address of 192.168.0.5 whenever it’s connected to my home WiFi (I’ve configured DHCP not to assign addresses under .11). Go to my DNS provider, and create an A record for dev.ourairports.com pointing to 192.168.0.5. In my laptop’s own /etc/hosts file, hard-code dev.ourairports.com to point to a 127.0.0. * IP address. With these steps, the domain dev.ourairports.com will always work from my laptop, wherever it’s connected, and it will work from other devices when I am on my home WiFi (anywhere else, it will probably bring up something strange, like a router or printer login page). I’ve played around with Docker a fair bit, but I’m still happy just running a bunch of VHOSTs for different webdev projects, and so far, it hasn’t caused me any grief. Does anyone have better suggestions? Any gotchas I’ve missed? I want you to sit still and watch these commercials. When the commercials come on, I get up to go to the kitchen or washroom. I’m making the commercials louder so that you’ll still hear them. I just bought a new remote with a mute button. Have I shown you my new VCR, with pause and fast-forward? If you fast-forward through commercials, there will be no more TV in 10 years. You’ll be sorry then. You must always start on our home page and navigate from there. We want you to see the photo of our CEO in a hard hat patronisingly glad-handing workers before you get the information you want. I’m bookmarking the pages I find useful and deep-linking to them. And your CEO is a twit. Look! Google’s not indexing most of your site any more. I want you to view the site exactly the way I intend, with 9-pt fonts, grey on a purple background, and 800 pixels wide. That looks horrible on my screen, and worse on my smartphone, and besides, my aunt can’t even read it. I’m going to my browser accessibility settings (or maybe I’ll just use Pocket). How dare Google News show headlines from our site? We’re sending them a court order to stop. Funny, I’m not seeing headlines from your site any more. I guess I’ll follow the links to stories on other sites. Our ads from ad networks and hidden tracking cookies allow us to monetize you by collecting personal data and selling it to marketing databases. If you block all our ads and tracking cookies, there will be no more web sites in 10 years. You’ll be sorry then. When might a company decide that web usability is a bad thing? Every field on this form is required, even though many of them won’t apply (e.g. 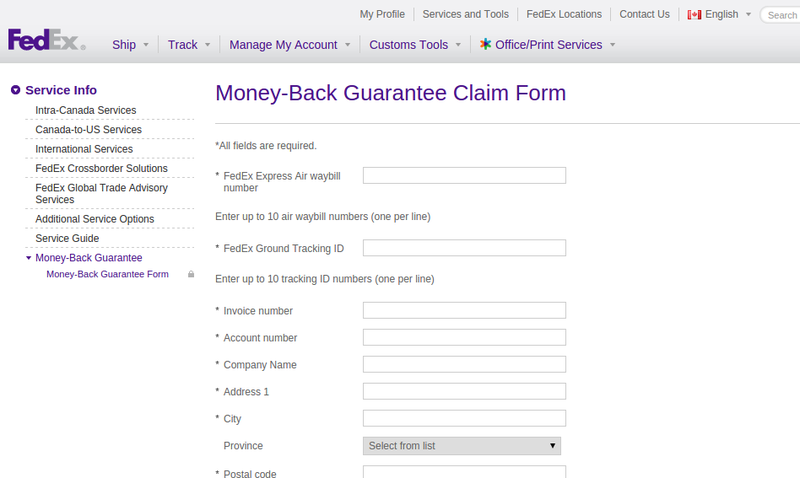 you might not have your own invoice number associated with the shipment, and you almost certainly won’t have a fax number), and some are actually contradictory (you will have either a FedEx Express Air waybill number or a FedEx Ground Tracking ID, but not both). On a higher level, nothing in the form makes it clear whether you’re filling in your address or the address to which you were sending the package. Flip a coin! Fortunately, the form also doesn’t bother with data-type validation, so I was able to put “n/a” in all the fields that didn’t apply (1995 called and took away my fax machine), and I was able to guess that they wanted my address, based on the presence of a picklist for Canadian provinces. If you’re an enterprising soul, you might consider setting up shop as a Web Unusability consultant, to help companies find ways to keep customers from filling out unwelcome forms. $ apt install emacs” — this is probably a better solution than the outdated distro below. In February 2014, I posted instructions for installing Gnu Emacs in older versions of Android. These instructions no longer work in Android L (Lollipop), because of a new requirement that all executables be compiled with a position-independent (PIE) flag. I have managed to create a new binary from Michał Zieliński’s admittedly now out-of-date patched Emacs version, and have made it available on GitHub. Since TerminalIDE also fails to run under Lollipop (lacking PIE), the instructions for installation are now somewhat different. Install some kind of a terminal emulator (JuiceSSH currently crashes, but others seem to work) in your Android. If you’re not rooted, then you must choose a terminal emulator that has its own home directory under /data/, where you can make a file executable and run it (you cannot normally make a file executable under /sdcard/). Create a new directory /sdcard/emacs/ to hold your non-executable files, such as eLISP files (you may choose a different location, but you’ll need to set some extra environment variables so that Emacs can find your files; that’s outside the scope of this posting). From my GitHub repo, download etc.tlzma, terminfo.tlzma, and lisp.tlzma, and unpack them all into your /sdcard/emacs/ directory — you may need BusyBox installed to get the unlzma and tar utilities required for unpacking, e.g. If your chosen terminal emulator already has TERMINFO installed, then don’t set it in the script. You may choose any home directory you want, but it must be writeable (Emacs will want to create a $HOME/.emacs.d/ directory to save settings). If your terminal type is unrecognised, you might need to add additional terminal types to emacs/terminfo; conversely, if your terminal emulator is already using a TERMINFO database somewhere, then don’t set the TERMINFO environment variable in your shell script. Crashes in a local shell under JuiceSSH — don’t know why yet (use a different terminal emulator). Update: only when the font is too large — seems related to screen width. Starts with the message “WARNING: linker: /data/local/bin/emacs.bin has text relocations. 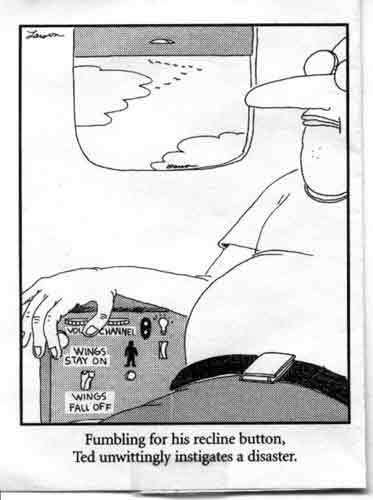 This is wasting memory and prevents security hardening. Please fix.” — this seems to be a common problem in Android L, and I have not yet found the right combination of GCC flags to fix it. Any volunteers to package all this up neatly, perhaps with some terminal emulator, for distribution in the Google Play Store? 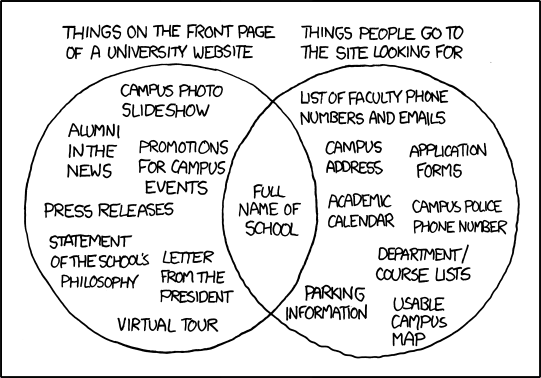 I refer to these two comics constantly when I’m doing technology architecture and design work. This year, the UN gave me the chance to bring people together to work on data standards for humanitarian crises (like the Ebola or Syria crisis). We put together a working group from multiple humanitarian agencies and NGOs and got to work in February. The result is the alpha version of the Humanitarian Exchange Language (HXL, pronounced /HEX-el/), a very different kind of data standard. What’s wrong with data standards these days? Switch to a different data format (and acquire and learn new software tools). Change the information you share (and the way your organisation collects and uses that information). Abandon what is valuable and unique about your organisation’s data (and conform to the common denominator). For HXL, we reversed the process and started by asking humanitarian responders how they’re actually working right now, then thought out how we could build a cooperative standard to enhance what they already do. Given the conditions under which humanitarian responders work in the field (iffy connectivity, time pressure, lots to do besides putting together data reports), we realised that an XML-, JSON-, or RDF-based standard wasn’t going to work. The tagging conventions are slightly more-sophisticated than that, also including special support for repeated fields, multiple languages, and compact-disaggregated data (e.g. time-series data). While HXL is still in the alpha stage, the Standby Task Force is already using it as part of the international Ebola response, and we’re running informal interoperability trials with the International Aid Transparency initiative, with planned more-formal trials with UNHCR and IOM. We also have an interactive HXL showcase demo site, and a collection of public-domain HXL libraries available on GitHub. More news soon. Thanks to the Humanitarian Data Exchange project (managed by Sarah Telford) at the UN’s Office for the Coordination of Humanitarian Affairs for giving me the opportunity and support to do this kind of work, to the Humanitarian Innovation Fund for backing it financially, to the HXL Working Group for coming together to figure this stuff out, and especially to CJ Hendrix and Carsten Keßler for their excellent work on an earlier incarnation of HXL and for their ongoing support.